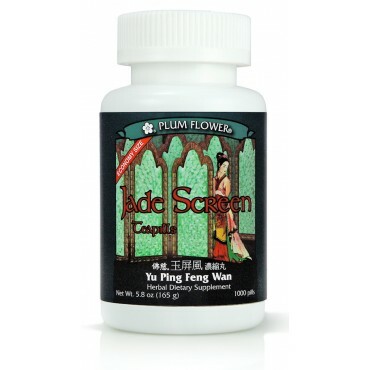 Deficiency of wei qi causing spontaneous sweating, sensitivity to wind, lowered immunity leading to recurrent colds, fatigue, pale or puffy complexion, low voice and poor appetite, Cold, cough, chronic hay-fever, allergies and chronic nasal discharge of white or clear mucus. Used with other treatments for AIDS, tuberculosis and weakened liver due to cirrhosis or hepatitis. Common cold prevention. 8 pills, 3 x day. (Dosage may be increased up to 12 pills, if needed.) 1000 teapills per bottle. Astragalus membranaceus root, Atractylodes macrocephala rhizome, Ledebouriella divaricata root. - Huang qi, Bai zhu, Fang feng.